Miss Peregrine's Home for Peculiar Children is intensely creative and unique, consistently giving me things I wasn't expecting. This is not to say I didn't have issues with the book, because I did. Though I love the idea of using quirky, odd photos to help narrate the story, there were certainly times when those photos seemed more forced on the story than supplemental to it. There were times, too, where it just felt so damned over-written. I just wanted to say, 'Pull back a little, buddy. One metaphor is fine.' And as I said, it sometimes felt a little dispassionate. But neither of these was a consistent problem, and the times when the book or the tone was nailed far outweighed the times when they were not. What I loved, though, was getting things I didn't expect. It's rare for a book to surprise me, and this one did so pretty consistently. There were some great lines and bits of unexpected description that just tickled me and had me pulling out my post-its tabs*. And there were characters and relationships among them that I did not see coming, and aspects of the villains that I didn't see coming (and I am rarely surprised or pleased by a villain). Most of all, though, I was surprised by the whole plot and who it all works together. 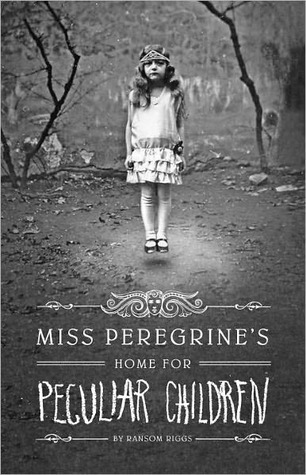 Beyond the expected elements of horror and mystery, there is romance and history and - something I can't get into it without being very spoilery - there was a crucial element to the plot, hinging on an ability of the titular Miss Peregrine, that I just did not see coming. And I loved it. And I sort of feel like that's all I can say without starting to give some major things away. As most people know now, there will be a second book (which, though it could be read and work as a stand-alone, I think a 2nd book was a bit of a given), and there will be a movie. <---- And this I am very eager for, as I kept picturing scenes while I was reading. It's very visual and some elements of the setting I just cannot wait to see onscreen. There is a sense of wonder that I hope they can catch and even expand on. Oh, and I love the design of the book. I know it's silly, but it gets points. Almost everything about the design is just a little tiny bit different than other books, showing that thought went in to nearly every aspect of it, from the very squared-off binding to the end papers and chapter-pages, etc. It's nice, that level of thought and attention to detail. I approve. *"But beyond all that, above the houses and fields and sheep doddering around like puffs of cotton candy, I could see tongues of dense fog licking over the ridge in the distance, where this world ended and the next one began, cold, damp, and sunless." Don't forget, you can enter to win 1 of 3 copies of this during Helluva Halloween!! I'm glad to see you liked this Misty! I'm currently reading this one now, and so far im enjoying it as well, although i was nervous as you were!! Oh, I am so glad this gets your stamp of approval. I've seen so many mixed reviews of this out there, but I know I tend to feel about the same way you do about books, so looks like I'm off to find a copy of this! This is on my TBR list.